Starring: James Mitchum, Mike Lane, Joe Donte, Timmy Brown, Chuck Morell, Charles Dierkop, George "Buck" Flower, Robert Z'Dar, and Frank Sinatra Jr.
Carmine Longo (Lane) has just been released from prison after a seven year stretch. He’s a dangerous Mafia hitman who’s going around L.A. killing members of a secret squad of justice-doers named “The Zebra Force”. Longo blames them for his incarceration. When Frank Barnes (Mitchum) gets wind of this, he’s not happy. With the help of second in command Jim Bob Cougar (Brown), who, despite the redneck-sounding name is actually a Black guy, he re-assembles the Zebra Force to rally the troops against Longo, his benefactor Voce (Donte) and a whole panoply of baddies they’re now embroiled in a war with. 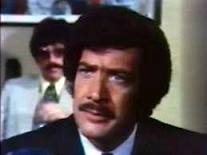 On the side of the law, Lt. Dietrich (Morrell) is tired of the corrupt system that lets criminals back on the streets, so he secretly applauds what The Zebra Force is doing, as does cop Bundy (Flower). Will the awesome power of The Zebra Force and their too-tight black bomber jackets prevail? Now this is the type of movie we’re always championing here at Comeuppance Reviews - a street-level revenge actioner from the 80’s that got lost in the video-store shuffle of the day, with a ton of unintentional comedy and amateurish gaffes, that’s hugely entertaining and a complete product of its time. 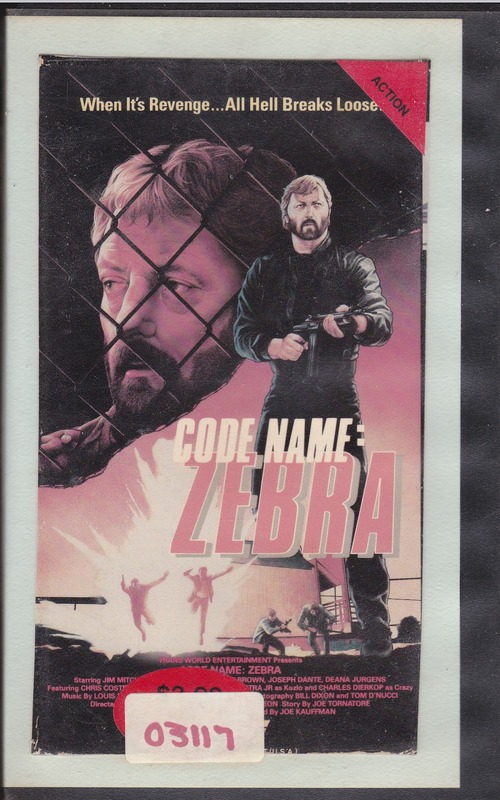 Movies like Code Name: Zebra will NEVER be made again and are windows into a world long past, never to return. They should be treasured, or, if not that, at least given a fresh look today. Starting with alternating white-on-black, then black-on-white credits (get it?) with some classic 80’s blaring sax on the soundtrack, before the movie even properly starts, we’re totally in the spirit. Then we see a street scene with some kids breakdancing, and we’re in VHS heaven. And once we realize a bunch of Vietnam vets are fighting the Mafia, which includes Frank Sinatra Jr. and Robert Z’Dar (playing a character with the classic Italian name of “Shigaru”) of all people, you just have to surrender to the charms of Code Name: Zebra. There’s also a character named “Crazy” (played by Charles Dierkop of Blood Red, 1989 and Liberty & Bash, 1989) - not “Crazy Jim” or “Crazy Uncle Stuart”, just Crazy. You gotta love it. Plus there is some priceless dialogue which is filled with odd turns of phrase and confusing malapropisms. Gems include “He’s the finger”, “Let’s go bye bye” and personal favorite “He’s a thumbs-up guy.” Not a stand-up guy, a thumbs-up guy. Who wrote the dialogue, the afore-quoted five year old who’s not a baby anymore? Because if so, he should get a Writer’s Guild award. Eggheads with Master’s Degrees in writing couldn’t come up with such priceless material. And it’s not just the lines being said, it’s how the audience hears them - the ADR is truly laugh-out-loud funny here. Voices come out of nowhere, from odd directions, and are certainly not being said by (or matched to) the actors on screen. Thankfully fan favorite George “Buck” Flower was not a victim of this, because his voice in the movie is very unique and memorable. We also like Jim Mitchum, but to most people this probably wouldn’t be considered his finest hour. We tend to disagree. He puts in such a hilariously phoned-in, uncaring performance, you have to respect the man. We haven’t seen such obvious disdain and contempt for even having to be on set since Burt Reynolds in Malone (1987). Totally awesome. The VHS tape released by TransWorld is sharp, bright and colorful even today. They did a great job. Much more fun than The Zebra Force (1976), the movie that this is a sequel to, we definitely recommend Code Name: Zebra. I'm confused, here. 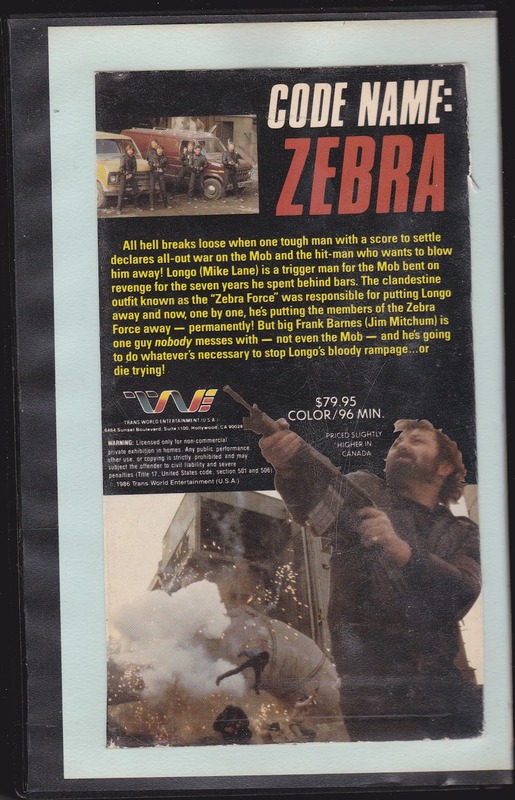 I thought that this film WAS aka Zebra Force from 1976. Are these actually two different films? Searched Google and every link seems to regard them as one and the same. It is very confusing, but they are definitely two different films. Code Name: Zebra has no reviews on IMDB...just a brief write-up on Critcon Online. Yeah that is confusing, fortunately Amazon has this film on DVD-R.
That's cool that Amazon has this...hopefully more people will watch it...it is perfect to watch with buddies.